The latest in Multiplay's i-series LAN parties took place this weekend, and we were there to cover all the action. As with i25, which we covered back in the summer, there was all kinds of action happening including exhibitor displays, tournaments and even a sneak preview at the hottest new launch of the year. The crux of the i-Series is, of course, the LANing. There were around 900 gamers this time around, and a cursory glance around the room confirmed my suspicions: the games of choice were World of Warcraft and Quake 4. There was a relatively small amount of F.E.A.R. being played, possibly because of the huge system specs required to play. 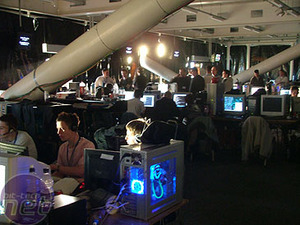 There was also a large Battlefield 2 competition, sponsored by Creative. 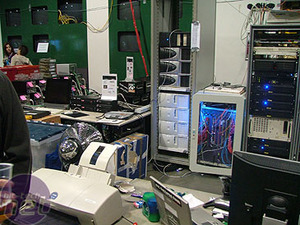 As always, Multiplay had their huge stack of server hardware on display. 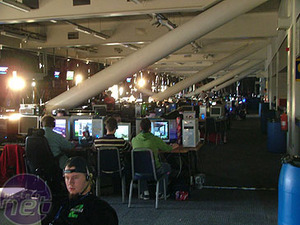 There were the obvious tournaments, including Counter-Strike: Source and 1.6, Call of Duty 2, Quake 4 and Battlefield 2. Additionally, there were a number of 'big games' organised which had more of a retro take on multiplayer proceedings. Throughout Saturday, there were large servers full of gamers playing Enemy Territory, Joint Ops and the massive classic, Tribes. 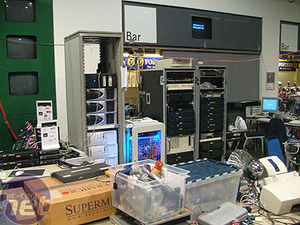 Perhaps the most stunning event of the show was the fact that Microsoft turned up with twelve Xbox 360s in tow. 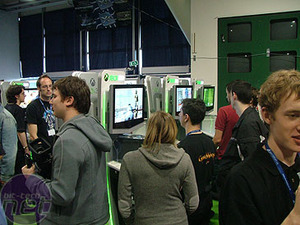 Gamers were able to play on the consoles all weekend long, and were treated to a host of titles: Kameo, Perfect Dark Zero, Project Gotham Racing 3, Fifa 2006, Dead or Alive 4, Ghost Recon 3 and Call of Duty 2. 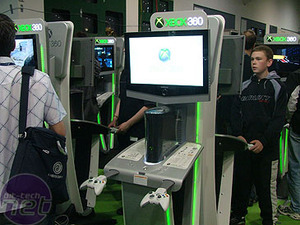 We'll have a full report on the Xbox 360 over the next few days, in the lead-up to the US launch.